We were in Saigon for a short trip, as we needed to leave Thailand for a visa run. Our experience here really made us crave more. The city itself is beautiful, filled with parks, tree-lined streets and friendly faces. The negatives we had heard about the dizzying, chaotic city seemed irrelevant. We went to Saigon to try their street food. It’s good, very good. Even with the overwhelming amount of meat dishes and non-existent vegetables other than herbs, or the violent food-poisoning* we got, we did eat some of the best food we’ve ever had. Our days were mapped out in terms of different food stalls, with the incredibly helpful advice from Legal Nomads and EatingAsia. We couldn’t find every place on our list but always found palate-pleasing alternatives. Some spots might have moved, shut down, or the timing was just off. Note that hours of operation here are quite sporadic. But, there are so many options on every block; you won’t go hungry. I highly recommend getting yourself out of the expensive (for Vietnam’s standards), tourist blocks and look for spots that are busy with locals. And, get up early for breakfast. An incredibly comforting and delicious soup from Huế, the former imperial capital, in central Vietnam. We stumbled upon this spot on our first morning, as it’s down the street from Bánh Mì Huỳnh Hoa (see below). When we realized the sandwich shop didn’t open for another 4 hours, we kept walking to find something else. Just a few yards away, we came across an alley with one vendor set up, a few tables and locals crouched over soup bowls. I had recognized the name of the dish that was written on the side of the stall, so we opted to give it a try. Rich beef-bone broth with chili and fermented shrimp paste, rice vermicelli noodles, slices of beef and a dense slab of pork, this bowl of soup was a mind-blowing introduction to Vietnam. The fresh herbs and lime, served on the side, brought the dish together. Our giddiness was topped off by the kindness of the family who owned the stall. In the alleyway of Hẻm 36 Lê Thị Riêng, District 1. Open in the mornings, and they seem to close up by about noon or so. 35,000 Dong per bowl. Bread, finally! The former French colony was influenced by French cooking, and for that, we are grateful. After being starved for bread for the last two months in Thailand, we couldn’t wait to get our hands on a baguette. Do note that “bánh mì” means bread in Vietnamese, so it doesn’t necessarily mean a place serves the tasty Saigon sandwiches, unless you see stacks of meat (“thịt”) in the window. You can’t miss the colorful array of pork slices & pâté. Tell them you want it spicy, and they’ll add peppers to the cilantro & pickled vegetables. This place doesn’t have any seating available. We would take ours’ to one of the many parks in Saigon and sit on a bench in the shade. There are also coffee shops and small bars on this street. You can order a drink and ask if it’s okay to eat your sandwich there. It’s very commonly done, and no one seems to take offense. Bánh Mì Huỳnh Hoa, 26 Lê Thị Riêng, District 1. Open 2:30pm to 11pm. 32,000 Dong per sandwich. More pork and bread, sure. Op La is a familiar breakfast for the Western palate: fried eggs & sausages, served with a baguette. Many places on the street serve op la, but we were won-over by the description of Hoa Ma Quan. Definitely order a side of mayonnaise and pâté. And, definitely get there before 10am, because they’ve been known to run out of food. Hoa Ma Quan, 53 Cao Thang, District 3. Open 6am to noon. We arrived at this no-name restaurant seven minutes after they had opened. There were already 20 people crowding the tiny storefront. Inside the narrow room, every red stool was seated, and people were standing in the walkways and corners, awaiting the next available seat. The noodle shop is owned by four sisters who sit at the front of the shop, in assembly-line fashion, dishing out bowls of bahn cahn. I had read that this place was all about patience, so we did our best to calmly wait. Some people came and went more quickly with to-go orders, while others filled a stool as soon as it was available. I was a bit nervous about getting a seat, as some people saw our camera and thought that we were there just to take photos, and no one seemed to speak English. One man waiting with us, gestured to me the notion of eating soup. I nodded yes, and pointed to Jason, and he acknowledged that there were two of us. He kept his eye out for me and told the sisters that we wanted to eat. A young woman & her boyfriend pointed to me when there was a seat available, even though they had arrived before us. I motioned that they should sit down, but they insisted, and we inched ourselves inside. The tightly packed room had a few dozen of the red plastic stools which were about a foot tall. People used them for seats and tables. If someone was lucky to have an extra stool, they would stack two, so the hot bowl was out of their hands and closer to their mouth. There are little plastic bowls below the stools that held discarded pork bones. The room was quite quiet, and the sisters are really the only people talking, as one yelled orders to another. The young couple soon followed behind us, helped place our order and got iced tea for us. Even before we had received our food, the experience had been memorable. We were astounded by the curtesy and respect that was shown by fellow diners. The soup arrived and proved to be worth the wait. The broth gets its vibrant red color from annatto seeds. It’s served with Udon-like noodles, made from tapioca or rice flour, and a chunk of pork hock. Lime and white pepper top the bowl, and a side of chili sauce is served for the pork. It’s a damn good bowl of soup. As we ate, I noticed that the crowd outside had disappeared. I wondered if their rush was over. Not only was the rush over, but service was done. When they’re out of soup, they close up shop. That day, they managed to sell out in 40 minutes. Bahn Cahn, 12C Nguyễn Phi Khanh. Open at 3pm and can sell out in 40 minutes; get there just before 3pm. Phở is originally from northern Vietnam, so the phở in Saigon is different than the phở in Hanoi. But regardless of where you are, you should eat phở. We found a great spot while on our way to another restaurant. We ate there twice, and both times were super delicious. They also set up a grill on the sidewalk. We tried the grilled squab and octopus. The meats were cooked perfectly and served on a platter with cucumbers, calamansi (a sweet lime found all over the South Pacific), white pepper & chilies for dipping. The phở bò (beef) and phở gà (chicken) are bright from the lime juice, with a clean and soothing broth. This spot actually saved us when we had gotten ill the night before. The soup was healing and easy on our sensitive stomachs. I couldn’t finish all of mine, and when I asked for it to-go, they added a generous amount of broth to the container, basically giving me a whole new bowl of soup. Phở Hong, 143 Đề Thám, District 1. Not sure of operating hours, but we went in the evenings. Bún thịt nướng is a bowl of rice vermicelli noodles, grilled pork, herbs, cucumber, chilies & fish sauce. Order it with chả giò, the most delicious and crispy, pork spring roll. None of the ingredients are served piping hot, so it’s actually really refreshing on a warm day. We tried it at a couple of places, and Legal Nomads’ suggestion was our favorite. If you get there too late (8pm), they will most likely be out of spring rolls. Chi Thong, 195 Cô Giang, District 1. I’m not sure when they open, but they close up around 8:30pm or 9pm. I would suggest an early dinner. In looking for another soup, we found this one. I was bummed at first when we couldn’t find what we had set out for, but whenever this happened, we easily found an alternative. Set up on the sidewalk, of course, with her back turned shunning cameras, a woman ladled out bowls of this chicken & glass noodle soup. The young woman who was serving spoke English and took good care of us. She also warned us that the chef did not like photos. The broth is clean like phở, but the noodles change the dish drastically. They are so gelatinous and soaked in chicken broth, you feel like you’re eating chicken fat. In a very good way. Lý Tự Trọng, between Pasteur & Đồng Khởi, District 1. We were there in the middle of the day. 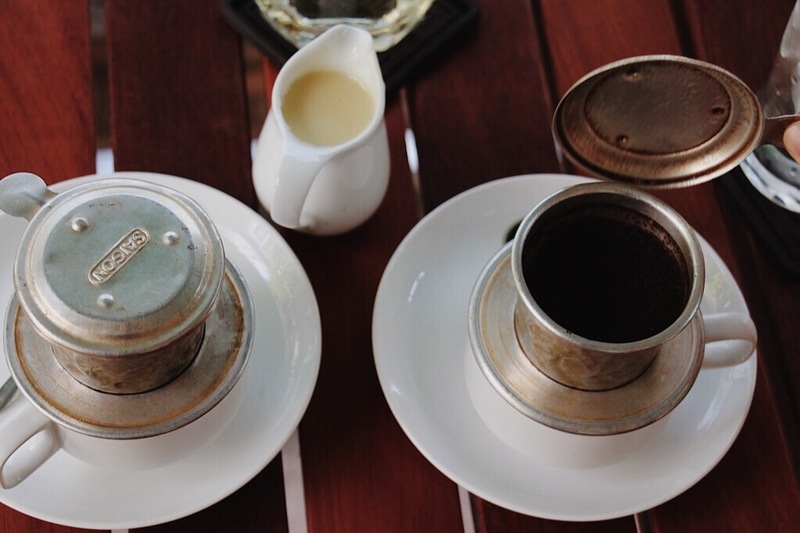 Rip filters used for brewing Vietnamese coffee, with a side of condensed milk. Vietnamese iced coffee with milk. Drink it. Just do it, and don’t worry about it. *A side-note on food poisoning: it happens. It happens in the States, it happens in SEA. Thankfully, we had antibiotics for stomach infections and re-hydration salts. When traveling, make sure you’re prepared for something like this to occur. We couldn’t have been more grateful that our first aide was stocked. When you’re that sick, the last thing you want to do is try and find a pharmacy. If this happens, above all else, stay hydrated. We are positive that we did not get sick from any of the places we listed above.